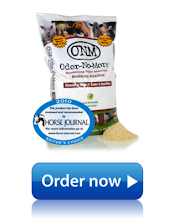 BioLargo, Inc. (OTCBB: BLGO) today (1-26-11) announced that through its wholly owned subsidiary Odor-No-More that it has joined forces with the prestigious Kentucky Horseshoeing School to develop and test preventative products that establish the highest ‘Standard of Care’, for the equine industry. Focusing primarily on the foot of the animal, the teams will work together to address major concerns in hoof health. Recognized throughout the farrier industry as a top clinician and educator, Mitch stays actively involved in all aspects of the farrier profession. 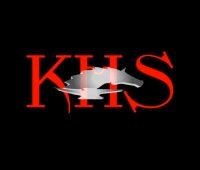 In addition to his work at KHS, he conducts numerous clinics for the international farrier and veterinary community and volunteers extensively with the American Farriers Association, where he has served on the Board of Directors and as Education Committee Chairman. Mitch has served on the American Farriers Association Editorial Review Board for many years. In addition he has hosted, and instructed the “Darley Flying Start” Program for many years which is an international management training program for potential thoroughbred industry leaders. The course syllabus which Mitch teaches touches upon several aspects of anatomy of the leg and foot ,practical foot care and shoeing, corrective farriery, and shoeing the problem horse. There are new estimates of the prevalence of foodborne disease out today. According to the CDC, about 48 million Americans — or 1 in 6 of us — fall ill each year because of something we ate. 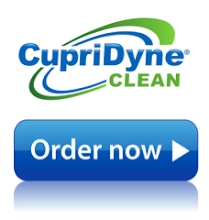 About 128,000 of those people are hospitalized and 3,000 die. In addition, these illnesses lead to “billions” of dollars in health-care costs, Chris Braden, acting director of the CDC’s division of foodborne, waterborne and environmental diseases, told reporters on a conference call. You’re probably wondering whether rates of foodborne illnesses have been improving. Turns out that’s hard to know. The CDC says the estimates released today can’t be compared with those out in 1999, which found about 5,000 deaths annually from foodborne diseases, because different methods were used. Data solely from the CDC’s FoodNet surveillance system point to a 20% reduction in illnesses caused by the pathogens it tracks over the last decade, the CDC says. The estimates out today encompass a broader range of pathogens, however. The culprit involved in foodborne illnesses isn’t identified in 80% of cases, while 20% were pegged to one of 31 known pathogens. Nor is the food source identified, or the way in which the food became contaminated. The pathogen contributing to the biggest proportion of foodborne illness is norovirus, making up an estimated 58% of cases, the CDC says. Trailing it are salmonella (11%), Clostridium perfringens (10%), Campylobacter spp. (9%) and Staphylococcus aureus (3%). 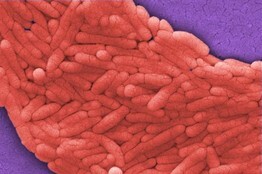 Salmonella, responsible for an estimated 35% of hospitalizations. Salmonella, contributing to an estimated 28% of deaths. Here’s a CDC page full of stats and figures on foodborne diseases. 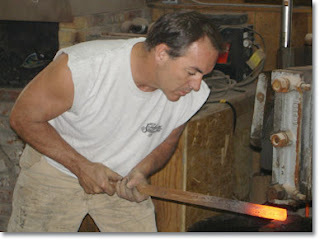 The word "farrier" comes from a french word for 'blacksmith' and was derived from a latin word meaning "iron". The modern farrier is the specialist in the care and maintenance of the feet of the horse. Remembering the reality that "No Hooves... No Horse" points to how critical the care of a horses hooves are to maintain a healthy horse. Imagine a horse that can't walk or run? Its no good! The article below helps us reflect a bit and admire old world skill of the modern farrier, but it also helps point out why BioLargo's Odor-No-More was just honored as a "Product of the Year" by The Horse Journal. 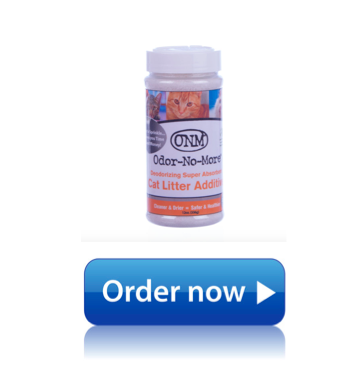 Odor-No-More keep horses safe and healthy like none other. I’m standing in the barnyard with the farrier. Remedy, the quarter horse, is getting his winter shoes. We’re surrounded by vast heaps of plowed snow. It’s a sparkling day, and for some reason I find myself thinking about a photograph we found after my father died. My grandfather is sitting on a high bank of snow, dressed in his work clothes, and he’s holding up a fox terrier, which looks as if it’s ready to eat the camera. This is the home farm in northwest Iowa, probably 1936. Behind him is the barn where the draft horses lived. I don’t know whether my grandfather was his own horse-shoer, but I doubt it. So there must have come many days like the one I’m having, standing in the cold beside a sleepy horse while a man with a badly damaged thumb and a sore back goes about his work. In all these years, the technology has hardly changed. 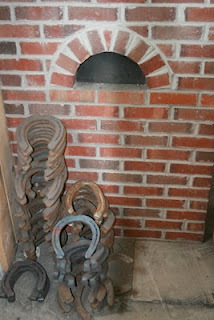 Fire, steel, nails, rasp, hammer, anvil, and a pair of heavy chaps with a hoof knife in a leather pocket. I knew that farm long after the horses had been replaced by tractors. When I was older, I tried to get my dad to tell stories about what it was like growing up there during the Depression. He would sometimes talk about the blizzard of 1936, and he talked about the kindly cunning of the draft horses, who loved to impose upon him. But those days were cloaked in a vagueness I never understood, as if the farm were a country he’d emigrated from and long since put out of mind. I wanted the details, what the work was like, what chores were his, how June differed from January. I never got them. So I look back at the old photos and try to imagine the life there. I think especially of a photo of my grandfather holding my dad on his knee and a pup in the other arm. My dad’s older brothers are there, all of them in ragged overalls and each one holding an apple. In the background there’s a long house for laying hens. What I wouldn’t give to go back and see it all. The closest I can come is to stand as quietly as Remedy does and wait for the farrier to finish. I close the gate behind him and send the horses thundering into the breast-deep snow of the pasture.